The Writer magazine is currently featuring Writer’s Residence in a “Take Note” article by Karen Rider. Naturally, we’re very pleased to get such great press about our service, but the best part is hearing from our customers, who are as much a part of Writer’s Residence as the site itself. We rely on user feedback to drive product development (and our own personal motivation). So many thanks to our users for all of the great input – you help us keep making the site better, and so far, it seems to be working. 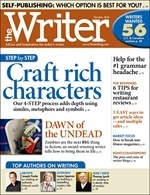 US residents can pick up a copy of The Writer at your local newsstands, or buy a copy online at WriterMag.com.